I did some hiking recently in the Canadian Rockies. There is some stunning mountain scenery over there, with glaciers, lakes of out-of-this-world colors, icecap-covered humongous peaks, abundant wildlife, and so on. But some of the most exciting finds for a sedimentologist/geologist like myself must be the beautifully developed deltas that enter the glacial lakes. ‘Enter’ is actually an euphemism here, because the rivers are slowly, but surely filling with sediment these magnificent bodies of water, and it is only a matter of a few hundred or thousand years before most of the average size lakes become relatively uninteresting flatlands. The delta at the updip end of the well-known (and somewhat overrated) Lake Louise is one of these lacustrine deltas. However, the one that really caught my attention is feeding into Peyto Lake. We got to the Peyto Lake overview area relatively early in the morning, when there was no wind, and the lake’s turquoise surface was perfectly smooth. Stunning view from high above, but most of my excitement evaporated (<– euphemism) when a busload of noisy (<– euphemism) tourists arrived and the viewing area suddenly felt like a Houston shopping mall on a weekend (<– exaggeration). So we started our descent toward the lake, on the trail that ultimately, if you are brave enough and rough enough (we were neither of these, but that is a different story), leads to Caldron Lake, above Peyto Glacier. 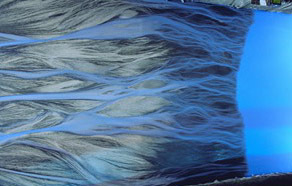 Such underflows often form in lakes when the sediment concentration in the river entering the lake is relatively high. In addition to the sediment concentration, the density excess can be enhanced by lower temperatures of the river. However, if the river is entering a sea or the ocean, it is much more difficult to form such underflows (that are often called hyperpycnal flows — just to make it a bit more confusing 🙂 ), because seawater has a lot of salt in it and therefore is denser than the river’s water. 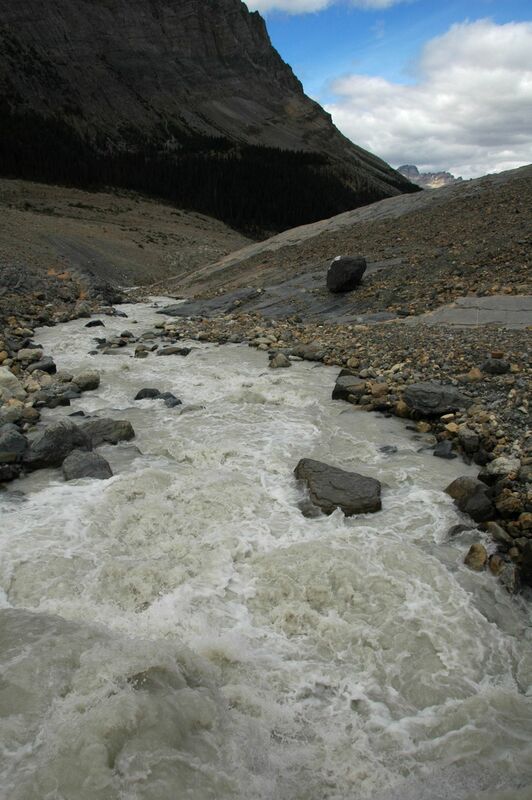 In this case, the sediment concentration of the river must be much higher to overcome the density of the seawater. As you walk up from the lakeshore toward the apex of the delta (which, by the way, has a classic triangular textbook delta shape), the size of the clasts on the delta’s surface slowly increases (statistically speaking). Further up, the valley gets narrow and then widens up again, giving place to a small minibasin. This minibasin probably was a lake some time ago, a lake that was completely filled. It turns out, of course, that I am not the first to note how superb this little sedimentary system is — there are a number of studies that looked at the density underflows of Peyto Lake. 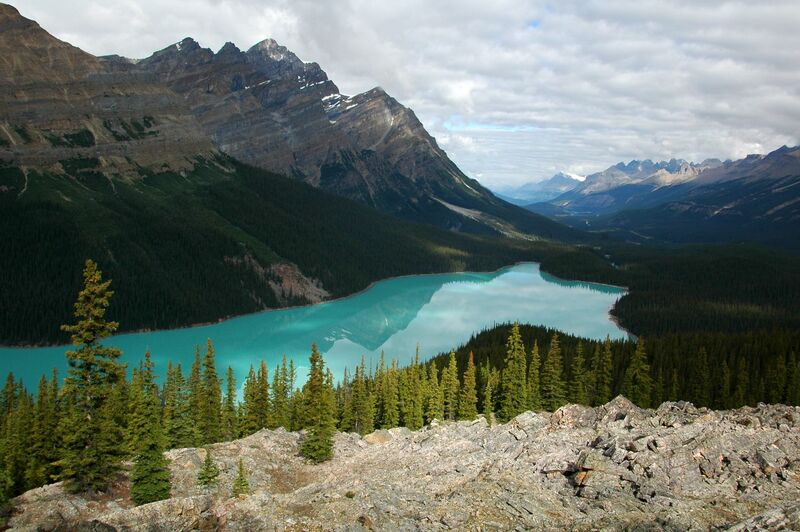 This article tells us that Peyto Lake has a 7 m high sill in the middle, which splits the lake into two subbasins. Underflows (or turbidity currents) fill with sediment-rich water the updip subbasin to the spillpoint, and then the underflow spills over into the other subbasin. As far as I know, this is the only documented example of a truly ponded turbidity current. It has also been calculated that 61% of the sediment deposited in the lake comes from the underflows (most of the rest of the deposition is due to delta progradation). PS: As Brian points out, the Peyto delta is remarkably similar to some of the experimental deltas generated at St. Anthony Falls Laboratory. 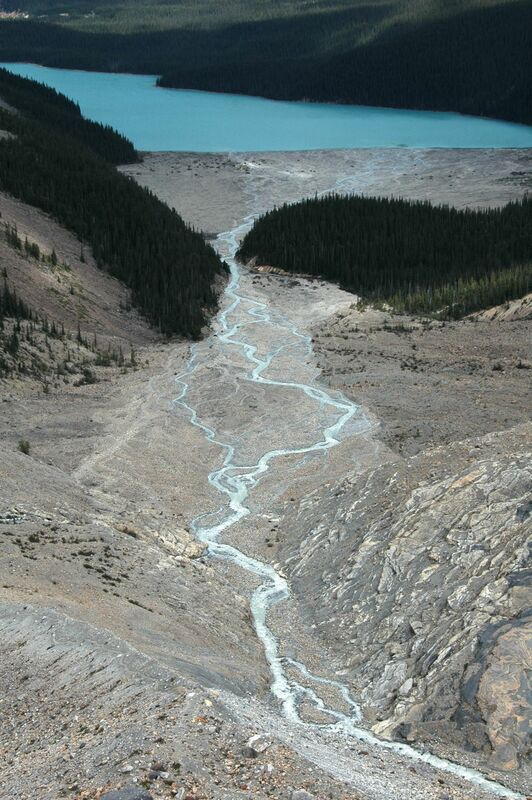 See for example the image above — it is *not* a lake in the Canadian Rockies! Those are remarkable photos; I’m glad Brian recently pointed me toward this post of yours! The comparison of an experimental delta with this real one is amazing. Thanks, Silver Fox — this place could be a fantastic natural laboratory that probably would scale very well with flume experiments. I stumbled across your blog post looking for images of Peyto Glacier after having just visited Banff National Park earlier this month. I’m a photography enthusiast and know next to nothing about sedimentology or geology but I found this post fascinating! 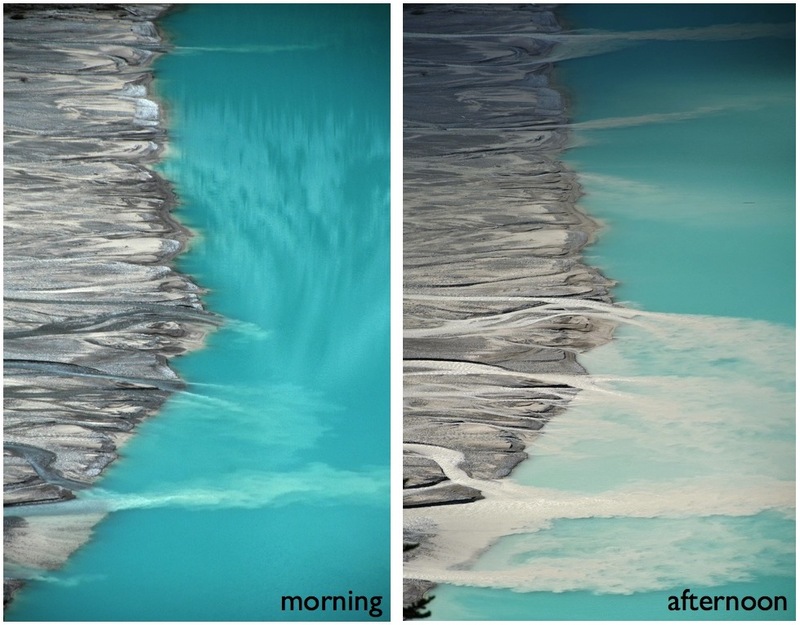 Great photo and explanation of the difference between the morning and afternoon sediment flow into Peyto Lake. Now I wish I had taken the time to hike down to the lake itself instead of just Bow Summit. I also found it interesting that the lake will eventually become filled up. Hi Kaitlin — thanks for the comment! Yes, it is absolutely worth hiking down to the lake, there are lots of opportunities for photography.